Three venomous, protected king cobras were found hidden in potato-chip cans being mailed to a Monterey Park man, officials said. 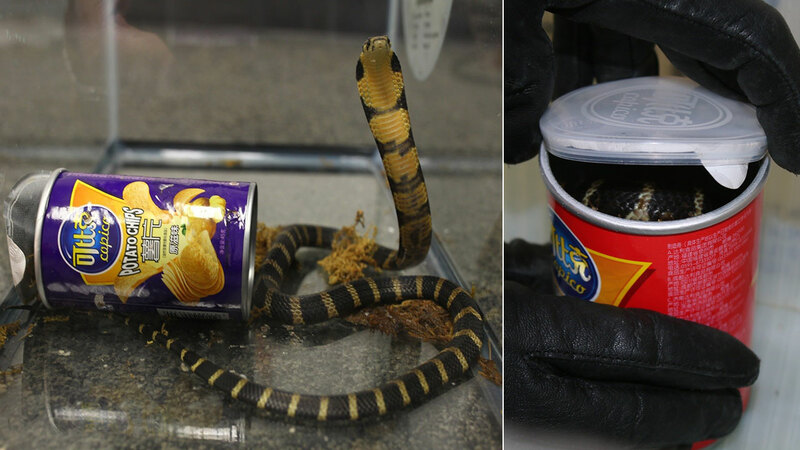 LOS ANGELES -- A California man was arrested for allegedly trying to smuggle three venomous king cobras hidden in potato-chip cans into the United States, officials said. Rodrigo Franco, 34, was arrested Tuesday by U.S. Fish and Wildlife Service agents and could face up to 20 years in prison for the smuggling charges, which includes allegations involving other reptiles and protected species. Authorities say when they searched his home, they found a tank in a children's bedroom containing a live baby Morelet's crocodile as well as tanks with alligator snapping turtles, a common snapping turtle and five diamond back terrapins - all protected species.